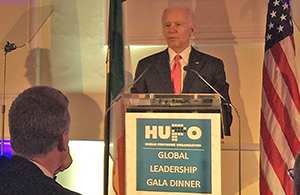 HUPO 2017 took place from 17th – 21st September in the Convention Centre Dublin, welcoming over 1,350 delegates from around the globe, including former Vice President of the United States Joe Biden. The Human Proteome Organization (HUPO) is an international scientific organization representing and promoting proteomics through international cooperation and collaborations by fostering the development of new technologies, techniques and training. HUPO was initially launched on February 9, 2001. On that date, a global advisory council was officially formed that included leading global experts in the field of proteomics from the academic, government, and commercial sectors. Over the next 12 months, the council, in consultation with industry, identified major proteomics issues and initiatives that needed to be addressed by HUPO. Embrace a forward-looking perspective to deliver an inflection point – a key milestone event – in the evolution of proteomics. One that will be a lasting legacy for the field. Engage new constituencies with the field of proteomics to support new scientific and new business opportunities. The vision for HUPO2017 Congress on “Integrated Proteomics for Healthcare Systems” was to create a meeting that would bring together world leaders with a new generation of scientists to promote HUPO’s capabilities for advancing our knowledge of the Human Proteome and the impact this will have on our understanding of health, disease and ageing. The Congress celebrated past achievements and presented new disruptive advances in proteomics. This was achieved with a balanced scientific programme that took into account previous milestone developments in proteomics, the current state of the art as well as newly arising areas and opportunities. This five day conference consisted of a broad and complex scientific programme including Seminars, Workshops, Debates on the latest Science and Technology developments, Sponsored Symposia, a Meet The Experts for PhD students & young researchers to further develop their careers, and an Exhibition to showcase the best of European public and private research. The programme included sessions covering each of the twelve current HUPO Initiatives and the Biology/Disease driven Human Proteome Project (HPP). In recognition of the increasing role of proteomics and complementary ‘omics technologies in personalised medicine there was a special focus on the application of proteomics to disease diagnosis, therapeutic protein production (and characterisation) and drug development as well as the analysis and integration of proteomic data. The presence of world-leading major international pharmaceutical biopharmaceutical and information technology companies in Ireland provided a wonderful opportunity for cross discipline information exchange and personal networking. The CCD provided a superb environment in which to present, discuss and advance proteomic research. The world class scientific programme consolidated existing knowledge while at the same time increasing awareness of leading edge and forward looking advances in the field. HUPO2017 has left a lasting legacy on the city. Delegates received a positive experience of Dublin and the HUPO2017 organisers received excellent feedback from all stakeholders involved in the conference. 1351 attendees from over 61 countries witnessed 223 oral presentations and took part in an incredible total of 668 programme presentations and were able to network and chat with 35 exhibitors. On top of this there were 10 innovation presentations and 18 meet the expert sessions. Attendees also had the opportunity to participate in a bio-informatics hub, an innovation stage, a quiz bowl and a treasure hunt. Finally, possibly one of the most exciting additions to HUPO2017 was the HUPO2017 Global Leadership Gala Dinner on Saturday 16th September. The event was catalysed in part, by the Cancer Moonshot initiative. The organizers were delighted that the 47th Vice President of the United States of America Joseph R. Biden Jr. delivered a keynote address at the dinner on the theme of “International Cooperation in the Fight Against Cancer.” The evening dinner event was held in the Royal College of Physicians in Dublin and brought together the world’s leading proteomic and proteogenomic researchers including those working on cancer research in the company of government, academia and industry leaders. The event focused on both raising awareness of HUPO and its activities, and advances in proteomics and their impact on human health, as well as the ICPC which currently comprises 11 countries and seeks to encourage more institutions to join this global partnership.